Join Roisin Murray for an evening celebrating the rich seam of stories and legends from around our coastline. Hear tales of shipwrecks, smugglers and pirates in this evening of storytelling for grown-ups. Thanks to Heritage Lottery Funding for the Guardians of the Deep project, this event is free. However, entry is ticketed and places must be booked. 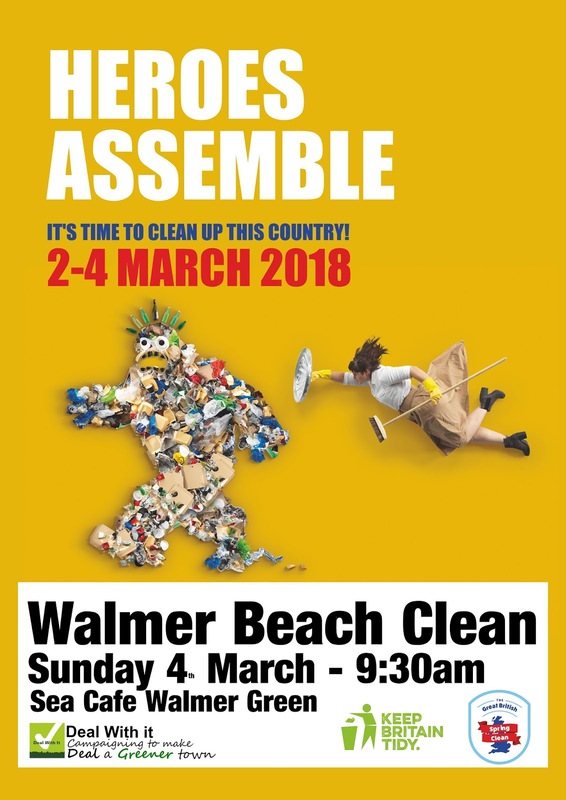 Our next Community Beach Clean will be on Sunday 4th March on Walmer Beach meeting at the Sea Cafe 9:30am. 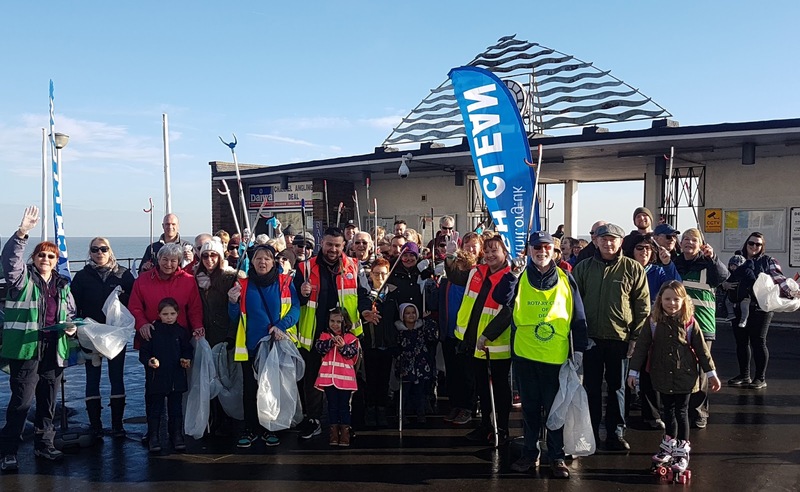 This clean will be part of the Great British Beach Clean happening around the country - Colleagues in Kingsdown will also have a Clean on Sunday 4th at 3pm on Kingsdown Beach plus there are local litter picks happening over that weekend in Dover. 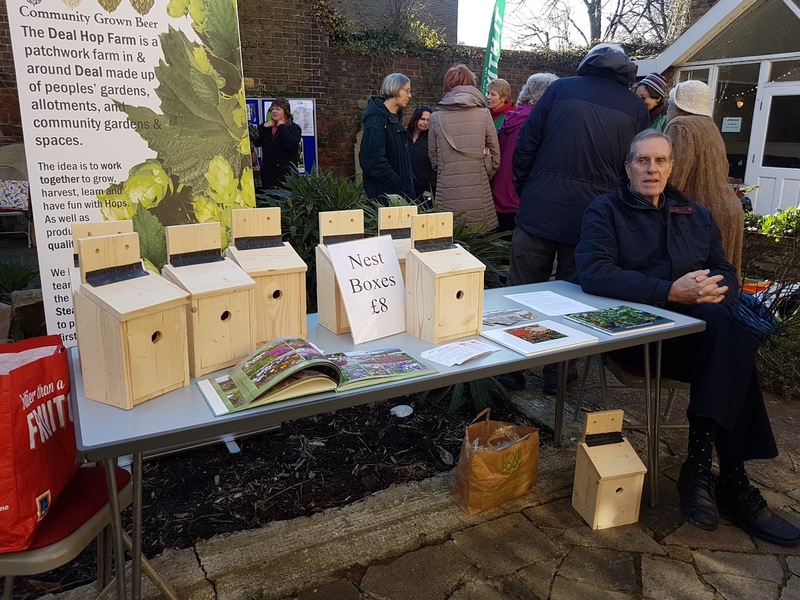 You are invited to join the Folkestone, Hythe and Dover Group of Kent Wildlife Trust on Friday 23rd February 2018 from 7.30 to 9.45pm at The Salvation Army Hall, Portland Road, Hythe, Kent CT21 6EG, for the first indoor meeting of the new year. 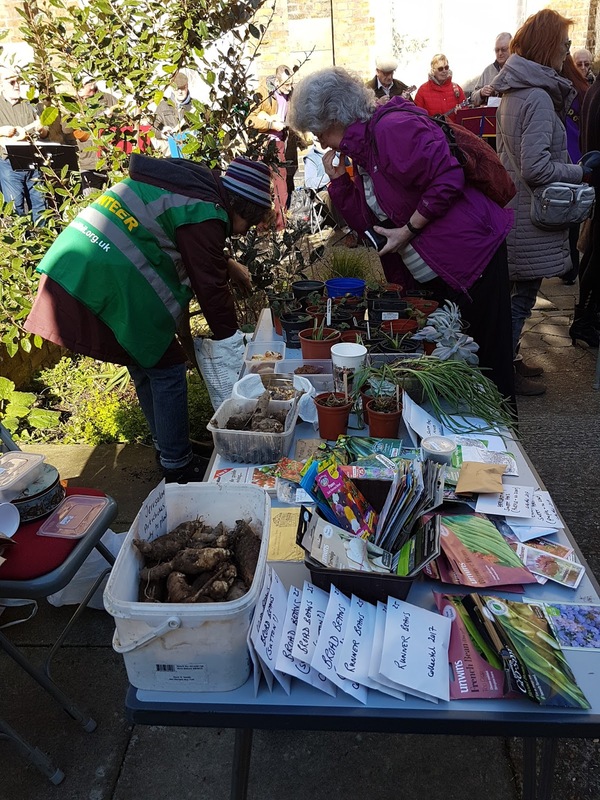 Environmental biologist Clive Nuttman will give us an illustrated talk which explains the process of pollination - the transfer of pollen between flowers - and how flower visitors of all shapes and sizes help to maintain floral diversity as well as playing a role in global food security. We hope to see you there. We are always looking for volunteers to help us put on our programme of talks and walks, so if this would interest you, please talk to one of our committee members during the evening. 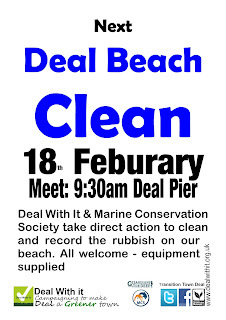 Thank you to our 100+ volunteers todays Deal Beach Clean. Glorious day to be on the beach. A group did the survey for the Marine Conservation Society while the rest of us wandered towards the rowing club from the Pier. Some 70 Bags collected with 47kilos of rubbish. 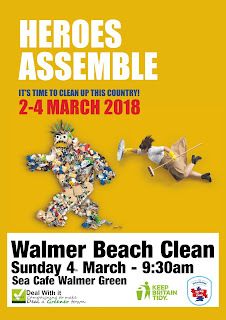 Our next Community Beach Clean is at Walmer (Sea Cafe) on Sunday 4th March 9:30am. This is part of the National 'Great British Spring Clean). 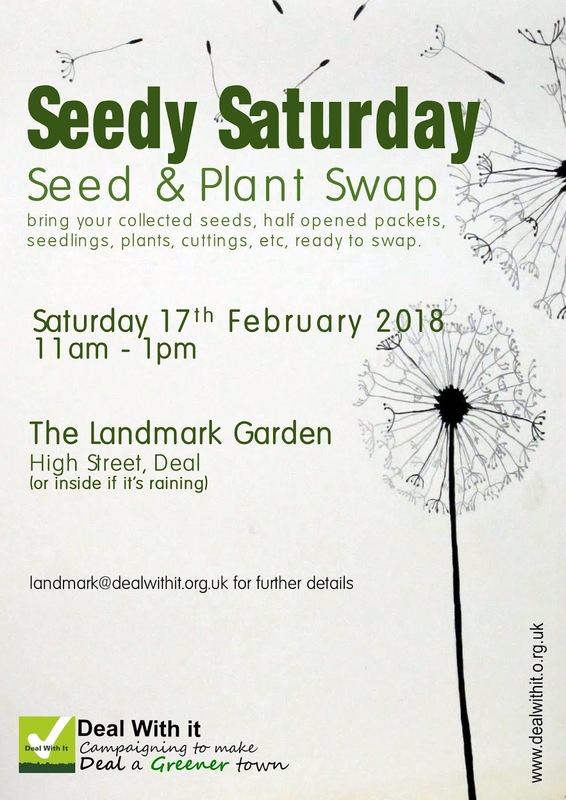 Thank you to everyone who came, donated or swapped seeds and plants at our first Seedy Saturday of 2018. We had stalls from Walmer WI promoting their Green Heart appeal, Sandown Castle Community Garden with some wonderful home made bird boxes (and great value!) produced by John Ford and our colleagues from Deal Hop Farm who were doing a roaring trade with their rhizomes. 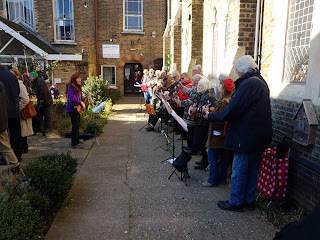 Many, Many thanks to the Landmark Ukulele Club who provided the entertainment and to Vicky & Sonja for the Cake making. The Swap table worked very well with some lovely donations from individuals and the Golf Rd Allotment holders. 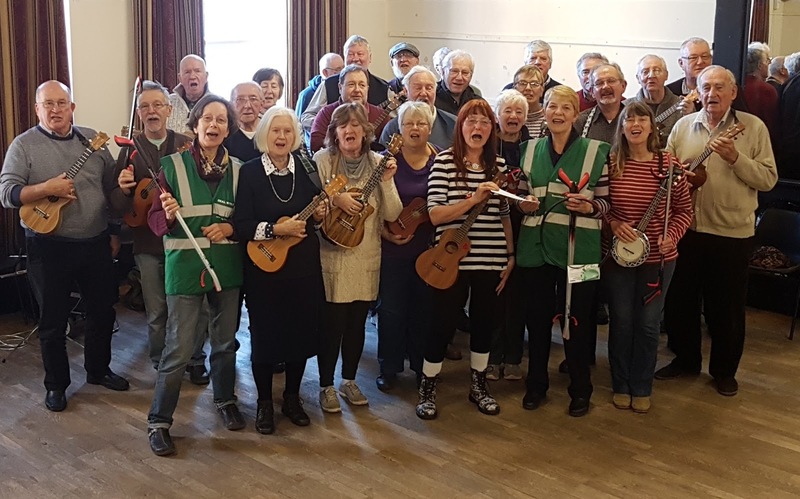 Thank you Sunshine Ukes and your colleagues in the Landmark Ukulele Club for supporting our beach clean work - your generosity has allowed us to get another 25 pickers and 10 bag holders. 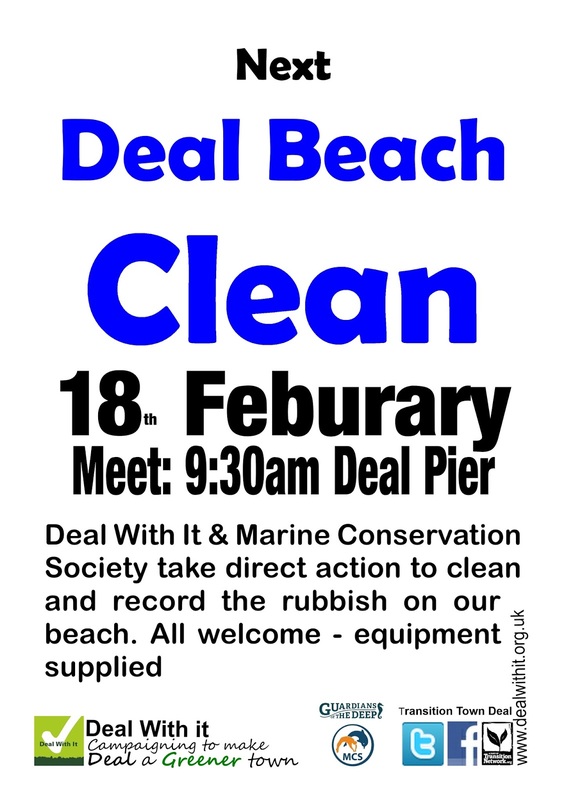 The next community beach clean in Deal will be on Sunday 18th Feb meeting at Deal Pier at 9:30am. Please dress for the weather - so lots of layers. We will provide pickers, bags, gloves. 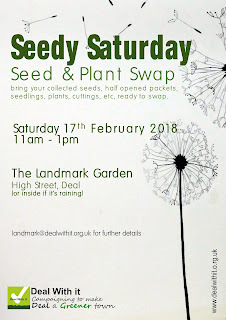 Our first Seedy Saturday - Seed and Plant swap will be on Saturday 17th Feb at the Landmark Garden 11am to 1pm. 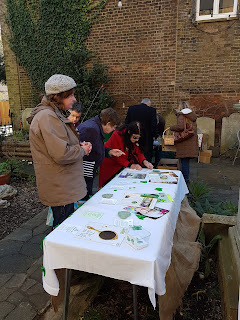 Well 2018 has started well: We had over 30 people at our annual gathering in January and produced a good list of ideas to make Deal Plastic Free. The next day we had over 70 people on our first beach clean and ran out of sign up sheets and pickers. 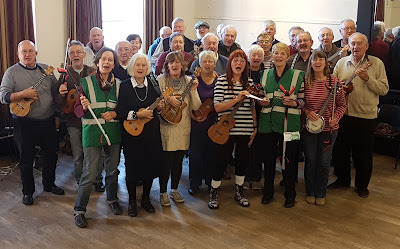 Local Ukulele players have come to our rescue - the Landmark Uke Club and The Sunshine Ukes have donated £200 each so we are getting another 25 pickers. Lovely community support. The Deal Hop Farm had 40 people at their AGM on the 28th and there is a lot of enthusiasm for its second season. 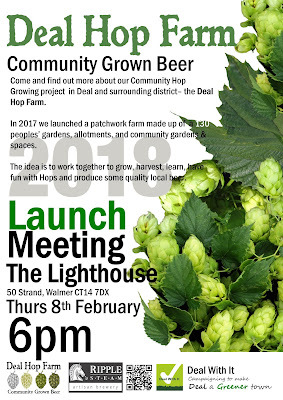 The Hop Farm has been invited to grow hops at Deal Castle’s Captain’s Garden and we are looking at ways in which this can be broaden into a small community garden with EH. Finally our colleagues in Transition Dover had a wonderful 1st Repairs Café - well done to them on a great initiative plus the second one is on the 27th March. Meetup to progress the ideas from the Annual Gathering on the 13th January. 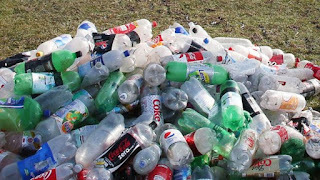 Progress on the REfill project with Kingsdown Environmental Group and looking at some action locally. 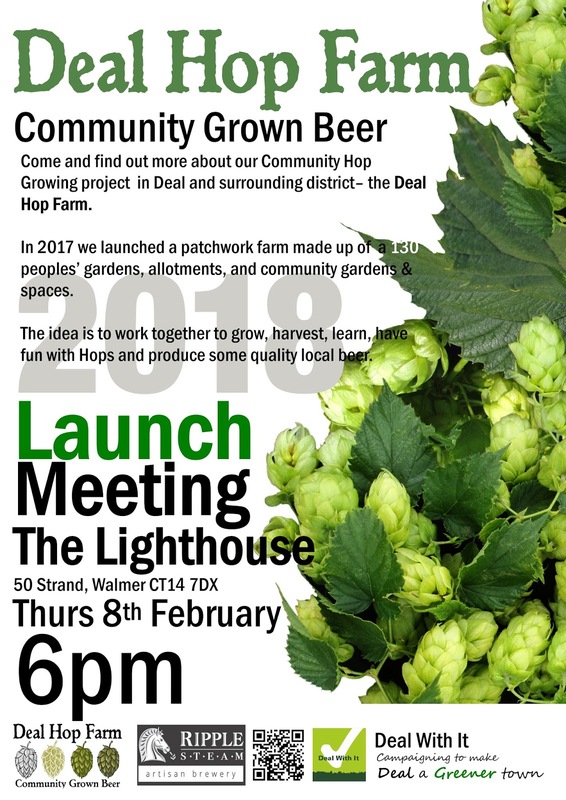 Deal Hop Farm - a Community Hop growing project in and around Deal is Launching its second season this week. We have a Launch Meeting at the Lighthouse Pub on the Strand Walmer on Thursday 8th Feb at 6pm plus there will be two information stalls at the Landmark Garden 10:30-12:30 on Saturday 10th and 17th Feb. Anyone wanting to find out more about the project are very welcome. 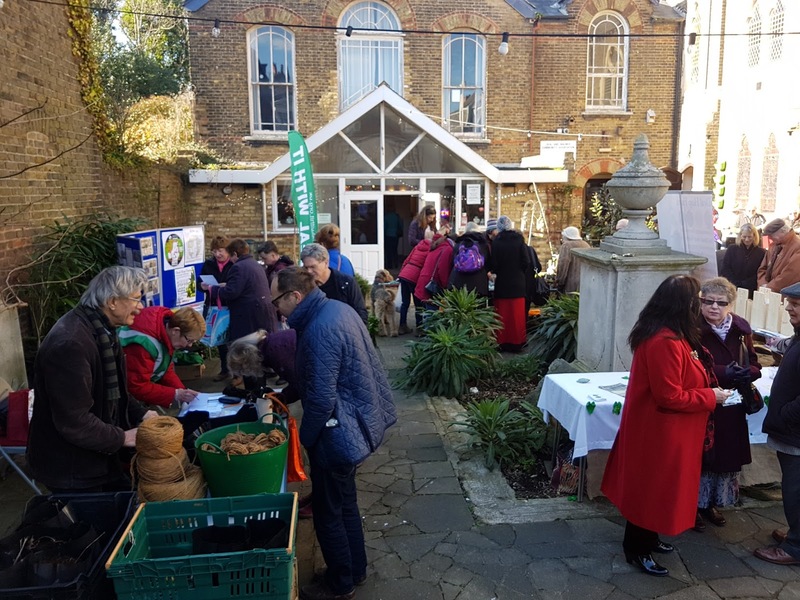 In 2017 we had 130 gardens, allotments and community gardens/spaces involved (with over 200 people actively participating). Our first Harvest produced 75kilos of hops which out Brewing partners Ripple Steam Brewery produced some 5,600pints of Hopping M.A.D - Made Around Deal (green hopped beer) which was available in some 35 pubs in East Kent. Members got a discounted case of the bottled version and the Brewery donated casks to our Oktoberfest celebration of our first season. What is DDC/KCC doing on recycling plastics ?